This month has been nothing short of exciting with our wedding (!!) and a couple of incredible trips away, but our stay in the stunning Maldives is not to be forgotten (how could you when it looks like that?!). So, in today’s blog post I’m sharing with you seven unmissable things you really have to experience at Club Med Finolhu Villas in the Maldives (‘cause epic breakfasts and magical evenings are not enough). It might be a bit of an ask to rise at 5:30AM, but I can assure you, this is one early AM you won’t want to miss. With the sun rays painting the dark sky in an array of warm hues as it rises, the sunrise in the Maldives is a sight to see. If I don’t say so myself, there’s no better way to enjoy it than from your very own Overwater Sunrise Villa at Club Med Finolhu. Wearing a pretty lace dress by Palma Australia over my everyday Maldives uniform, a bikini (of course! ), I totally forgot about my need for a coffee as the colourful sunrise totally and utterly mesmerised me. 2. Cool down with a swim. At around 30°C all day, everyday, the best way to combat the heat and humidity is with a swim. The hardest part? Deciding whether you want to float in the calm Indian Ocean with the shy reef sharks and stingrays, or your very own private infinity pool. Oh, what a conundrum! He-he-he! Honestly though, I blissfully spent most of our days at Club Med Finolhu in both (and pinching myself over every single moment!). What would you choose? The ocean or the pool? 3. Spot the marine life. Brad and I also spent hours walking up and down the main walkway to the Overwater Villas, spotting reef sharks, stingrays and fish as they went about their days within the crystal clear water. My goodness, they’re just so incredibly beautiful. To say it was mind blowing to see sharks beneath us as we walked to and from our villa would be an understatement. I couldn’t peel my eyes away! The coolest thing is that the walkway is actually covered in solar panels, which power most of the resort. Pretty and environmentally friendly, yes please! 4. Walk on the beach. During the sunset, of course. If you opted for a Sunrise Villa like us, then you’ll want to take advantage of the infamous Maldivian sunsets from one of the private beaches on Club Med Finolhu. We made it a tradition to take a stroll along the beach to the bar before dinner, even if it is the long way around. It’s just so stunning. And, if you’re lucky, you’ll be greeted by hundred on little crazy crabs that call the beach home. Make sure you don’t step on the shells! 5. Enjoy a romantic dinner. We dined at Motu Restaurant every day during our stay in the Maldives, almost always opting to sit on the verandah so we should admire the marine life below, but on our second night we enjoyed dinner inside for the very first Club Med Fusions event. It was a brilliant and unique experience; a collaboration of senses by Michelin Chef Jozef Youssef and composer/pianist Tze Toh. The food was exceptional, the music emotional and the night memorable. I couldn’t recommend experiencing a Fusions event enough if you ever have the chance at Club Med. Amazing. 6. Explore on the Blue Lagoon Cruise. Our first experience of the Maldives was the exceptional Blue Lagoon Tour, which we were very excited to go on. 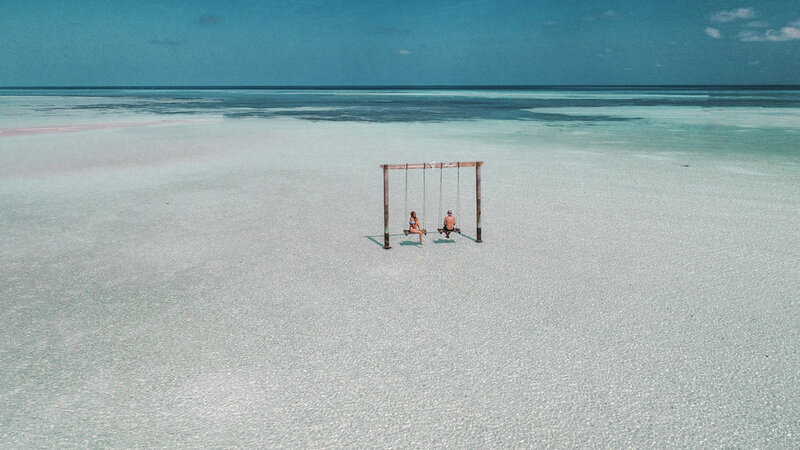 We took a speedboat to a tiny and remote sand island in the middle of the Indian Ocean, and then made our way into the warm tropical waters to swim with the small fish that surrounded the island. To be honest, I could have spent all day snorkelling – I was truly in my element. After visiting the Blue Lagoon, we found ourselves back on the speedboat to a local Maldivian island where we toured through the small school, local shops and enjoyed a refreshing coconut water straight from a coconut. It was delicious and fascinating all in one. Whether it’s in your private luxury villa (room service, anybody?! 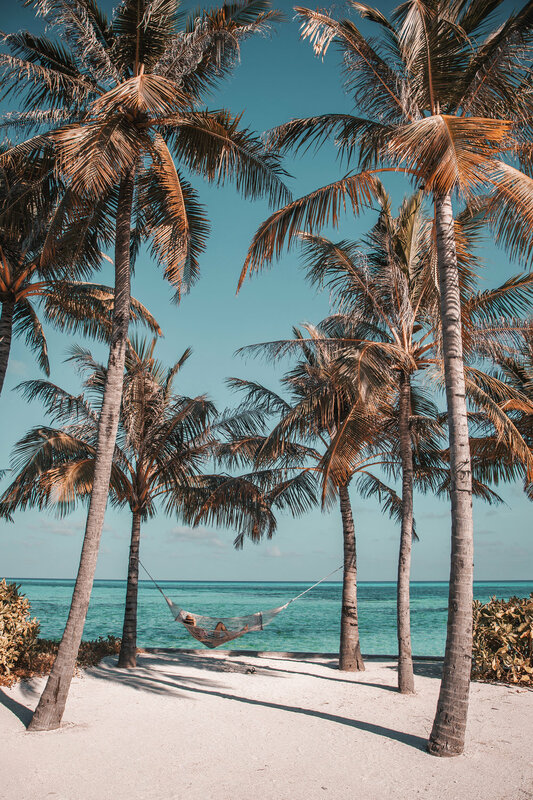 ), on a hammock on the edge of the private island or the swings in the ocean (how cool are they?! ), relaxing is a way of life here in the Maldives and Club Med knows exactly how to do it. After all that snorkelling, you deserve to rejuvenate in the most fabulous way possible. After all, isn’t that what island life is all about? Now, who else wishes they were at Club Med Finolhu Maldives right now?